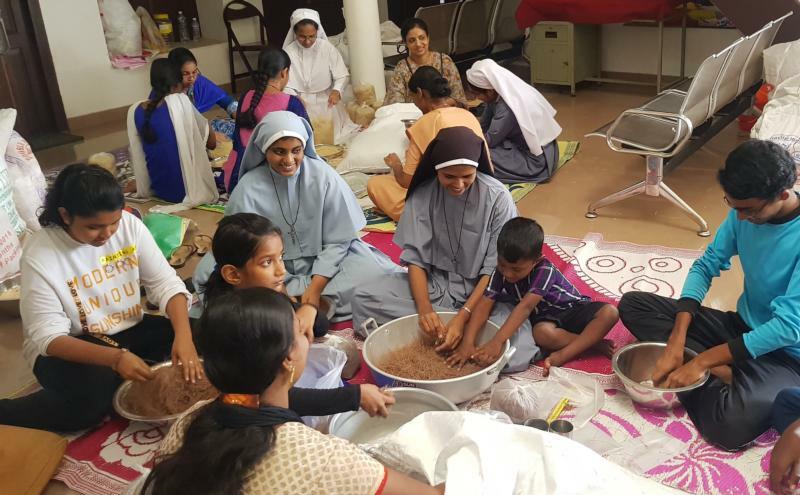 KOCHI, India (CNS) — More than 6,700 Catholic women religious are among those helping more than 1 million people taking shelter in relief camps after unprecedented floods ravaged Kerala state in southwest India. Three hundred nuns from 14 congregations are engaged in marathon-style counseling sessions for the 50,000 displaced people in 32 camps in Changanacherry in Kottayam district, said Sister Litty Kochuchira, head of the Devamatha province of the Franciscan Clarist Congregation. “When they return, many will have no house … We counsel them to accept what has happened, while assuring them that the government and aid agencies (will) help them build new houses,” she told Global Sisters Report. One resident of the Vazhappally camp is Shyam Lal, a Hindu air conditioning mechanic who told Global Sisters Report that he and his family lost everything but the clothes they were wearing when the floods came. “We were saved from the mouth of death. This is a new life for us,” he said. Saji Thomas is a freelance journalist based in Bhopal, India. This article is part of a collaboration between Global Sisters Report and Matters India, a news portal that focuses on religious and social issues.